There are a number of pieces of legislation which cover the the authorisation of GMOs. Which piece of legislation is relevant will depend on what stage of development the GMO is at and how it will ultimately be used. The following questions will help you decide which Regulations or Directive are relevant. The links will take you through to more detailed information. Alternatively click here to go to a text only version of this page. 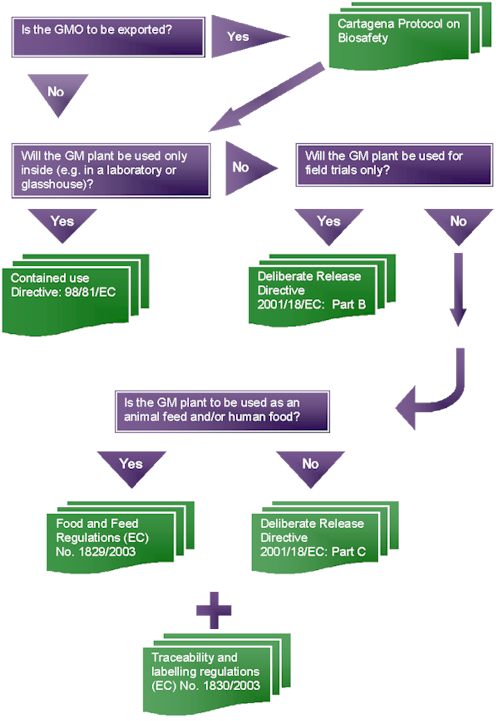 UK and European Regulation of Environmental Safety of Genetically Modified Organisms - Deliberate Release. European Food and Feed Safety Regulations.